"You didn't let your human babies cry it out." 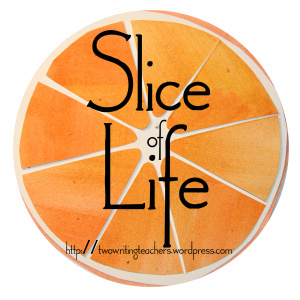 I am participating in the March Slice of Life Challenge: A slice a day for all of March. You should do it too! Thank you, Two Writing Teachers! Readers, check out their site, and start slicing! I’m also celebrating with Ruth Ayres today! H sitting next to me, his mini paper towels are complete, and he’s working on his mini Harry Potter Book. He sits chatting and singing Into the Woods songs, making miniatures. Finn, somehow still downstairs, not staring at the the bedroom door trying to sniff out the kittens. He sees something outside and leaps to our rescue. I don’t know what it was. A bird? A neighbor? A leaf? We will never know. E, drawing monsters in the kitchen. He has pages and pages of creative monsters he’s drawn. They have strengths, weights, evolutions, and awesome names. So many details, so much color. Things don’t stay the way they are for long. That’s the only thing that’s constant around here: Change. E was frustrated with his pictures, he’s taking a break from his coloring. H is done with this miniature book, he’s searching for his next project. Finn is finally tired out enough to rest on his couch in the sun. (As he should be, since I took him out for a 2 hour walk…) And that, friends, is something to truly celebrate. Home to slice, before I go hang out with my dog, and then snuggle the new kittens. Before that, we went out to dinner. I confess, I mostly wanted to go to get a little break from our dog, Finnegan whining about the new kittens. Before that, we spent time trying to get Finnegan to calm down at the closed door where the kittens were playing. Before that, I took Finn on an hour walk, hoping to tire him out a little. Before that, Finnegan was crying at the door and straining at his leash to see those kittens. Before that, we had the dog sniff the carrier holding a fluffy orange and white kitten. He stared a little, whined a little, and lunged a little. Fluffy kitten didn’t care — Didn’t even flinch. Before that, we took the tiny tabby kitten in her carrier towards the house. Finn sniffed, and the cat hissed. She was scared! Before that, we drove 2 kittens home from the shelter. Before that, we sat at the shelter deciding. We knew we wanted the orange and white cat, but the little tabby sat on my chest, all curled in. She was purring. Before that, we walked in. The kids went to the orange and white fluffy cat they knew they wanted. A little tiny tabby cat stared up at me, so I picked her up. Before that, the shelter volunteers told us two cats was better than one, and that it didn’t matter if we got one later. Before that, we took our one pet carrier out of the car and walked into the shelter. We only needed one. Because we were only getting one kitten. The orange and white fluffy one. Before that, the pet supply store people told us that we should get one cat now and two cats later, rather than two cats now and one cat later. Before that, I took a deep breath, reminded the kids that it was going to be a lot of work training Finnegan to ignore any new kittens. Before that, the kids did so many things to remind me that they needed kittens. I didn’t argue. I need cats in my life too! Before that, we were a home without cats for the first time in a long time. Before that, Susie passed away. Before that, Billy passed away. The vet’s office said Finnegan would like his medicine. “It’s in a chicken suspension, so it shouldn’t be a problem. He should like the taste,” they said. Yes, those are my Valentine’s Elmo socks. I wore them under my boots today. Then, I had to throw my boots away because they are broken now. That’s a different slice. A sad slice. I was going to crop myself out of the picture, but then I thought, I should be my authentic self. The vet was very, very wrong. I’m sure there’s a better way to do this. Finally, most got in his mouth, but some did splash on the floor. “UGH! Chicken juice on the floor!” my vegetarian family groaned. Luckily, Finnegan did like the taste when it was on the floor. If he ever needs this medicine again, I plan on just pouring it on the floor. Sunday evening, I was sure I had a slice for this week. A puppy slice! That day, we had finally decided enough was enough with our couch. Sure, Finn loved to sleep on the couch. He loved to snuggle on the side, sometimes propped with pillows. It was adorable to watch him nest himself in for a long cozy puppy nap. But, a few months ago, he spent a good deal of effort destroying parts of the couch. And even though he seems to have stopped that craziness, the couch did not heal. So, we took the couch to the curb this weekend, much to Finn’s disappointment. Then, we continued to try to teach Finn to sleep on his soft (and expensive) doggy bed. It’s the one he tried to eat 6 months ago, but will sometimes rest on for short amounts of time, when given a lot of praise. Sometimes. At last, a little before Mother’s Day dinner, Finn did rest on his bed, after we covered it with his favorite blanket. (It used to be my favorite blanket, just saying.) But, then we got a wee bit distracted by dinner with my parents, and we might have left the dog in the family room with his bed a little bit too long. After watching us rake the family room (and sweep, and vacuum…Thanks, Mr. Thought), Finnegan decided he didn’t need any couches or beds, because he had our Ikea chair, and he had me to put a pillow under his head. So, I thought I had my slice about Finnegan, the crazy Puppy. Oh that puppy! But then we took Finn to check out a doggy day care out in the country this afternoon. It was beautiful. A classic rolling hills farm: green grass, blue sky, wonderful people. He ran around with a few dogs while we talked to the owner. The kids ran off with the owner’s kids to look at the kittens in the barn. Finn wasn’t annoyingly interested in the kittens — he just licked them hello and went on his merry way. Bucolic. Peaceful. Perfect. And then he caught a rooster. We tried to catch Finn, and the rooster did get a way, a few times. And then someone caught Finn, and the rooster walked slowly into the pasture. A pile of feathers was left behind. “Does this get us kicked out of doggy daycare?” I asked. They thought the rooster would probably go off into the woods and die pretty soon. I think the image of my sweet puppy running with a giant rooster in his mouth will not die soon enough. Please, Finnegan, stick to killing couches and doggy beds. I’ve been reflecting lately about time. What do you do with the time you have? What do you do with the silence? What choices do you make? This poem feels unfinished, but for some reason I like the shape of it on the screen. I’m sure it will look different on a mobile version, but it swoops in a way here on my screen… so I’m calling it done. For now. It is silent in my house. Mr. Thought is working downstairs. I have a pile of should do’s. I got my grading out: I graded one paper. I’m looking at the basket of laundry: I’ll fold it later. The dishwasher needs to be emptied, and filled: You get the picture. Finnegan! You are 1 today. Then: We had never had a puppy before. Now: We can’t imagine our family without you. Then: Our house had legos and toys all over. Now: The children have learned they must put their toys away from you! Then: We enjoyed our open floor plan. Now: We open gates all through the house. Then: Kids didn’t seem to know where the shoe closet was. Now: Kids know they need to put their shoes away and close the closet! Then: We were cat people. Now: We are cat and dog people. Then: We could finally vacuum without a baby crying. Now: We vacuum as you bark at and chase the vacuum. Then: We brought snacks to the couch. Now: We can only eat at the table, or you will try to grab our food. Then: It felt selfish to go on a walk, leaving others at home. Now: It is generous to be the one to take the dog on a walk. Then: You loved to chew. Now: You love to chew. Then: You were such a cute little baby puppy. Now: You are such a cute big baby puppy.